Tired and stressed nurses across all wards at Royal Adelaide Hospital will come together next week to consider ways to reduce workloads amid fears patients' lives are at risk. 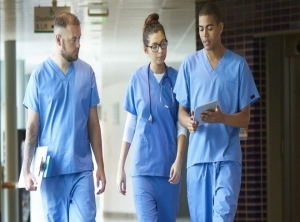 The Australian Nursing and Midwifery Federation says the action has been prompted by the absence of government measures to alleviate the pressures across the public hospital network. State secretary Elizabeth Dabars says the SA government is dragging its heels on implementing a "system-wide circuit breaker" to ease demand, especially in emergency departments. "This action is being driven by extremely tired and stressed nursing staff who simply cannot bear the thought of one more shift during which their patients' lives are put at significant risk," Ms Dabars said. "After more than 18 months of lobbying a Labor and now Liberal government, our RAH members have realised they can't rely on the government to help them provide safe and effective care for their patients." Nursing, ambulance officers and clinicians met with Health Minister Stephan Wade last week in a bid to find solutions to the high demand for hospital services which has forced some patients to wait on ambulance ramps for a number of hours before being admitted. The government says it will look to open transit lounges in metropolitan hospitals to better handle incoming and outgoing patients and has also moved some a patients to country hospitals. Health Minister Stephen Wade said on Wednesday the government would continue to look at ways to manage the spike in demand for services at the present time and also at longer-term strategies to make public hospitals sustainable. "We're looking at a whole range of options, short-term, medium-term and long-term," Mr Wade said. "But we've got to make sure that everything comes together. We've got to make sure that our strategies are viable and credible. "That's why we're going to continue to work with management and with the unions to make sure that whatever we do has a real impact as soon as possible."